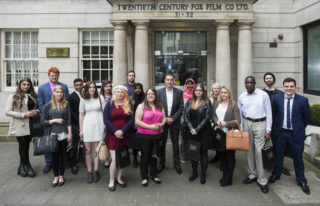 A further 11 vigilant staff members from cinemas across the UK have been recognised for successfully intervening to prevent the illegal recording, or ‘camming’, of films under the Film Distributors’ Association (FDA) and Federation Against Copyright Theft (FACT) on-going rewards programme. The programme provides cash rewards to cinema employees who identify individuals illegally recording a movie in a UK cinema and forms a key part of a wide-ranging theatrical protection programme funded by UK film distributors via FDA and operated by FACT. Additionally, an enhanced reward period, doubling the maximum reward from £500 to £1000 for cinema staff who prevent and report illegal recording between 20th April and 30th June 2015, has been announced. 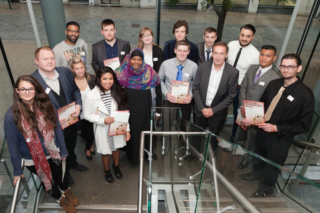 The 11 members of staff, including employees from Cineworld, Odeon, Vue and for the first time Showcase cinemas, were each presented with a certificate and cash reward at a ceremony hosted by Universal Pictures. Collectively, they represented 11 incidents, all of which police attended, with 4 leading to formal cautions and 3 leading to arrests. Since its establishment in 2006, the programme has rewarded 134 members of cinema staff for their vigilance for helping to protect a range of popular films, with titles in the current period including The Hunger Games – Mockingjay Part One, Fifty Shades of Grey and The Theory of Everything. Mark Batey, FDA Chief Executive, said: “The perpetual vigilance of colleagues in cinema exhibition across the UK is crucial in the fight against film theft. As we enter a summer packed with fantastic new releases, their great work in preventing and reporting illegal recording is more important than ever, and we are pleased to double the maximum reward available during this peak period to ensure the UK remains as secure a market in which to release all kinds of movies as possible”.